Time to me was considered constant. Looking at a clock and watching it tick would only be a waste. Life had to happen and the world of autism had to go along for the ride. This was my internal view of things and I finally wasn’t feeling the weight of insecurities that hounded me for a long time. Getting Oscar brought a breath of fresh air into my life. 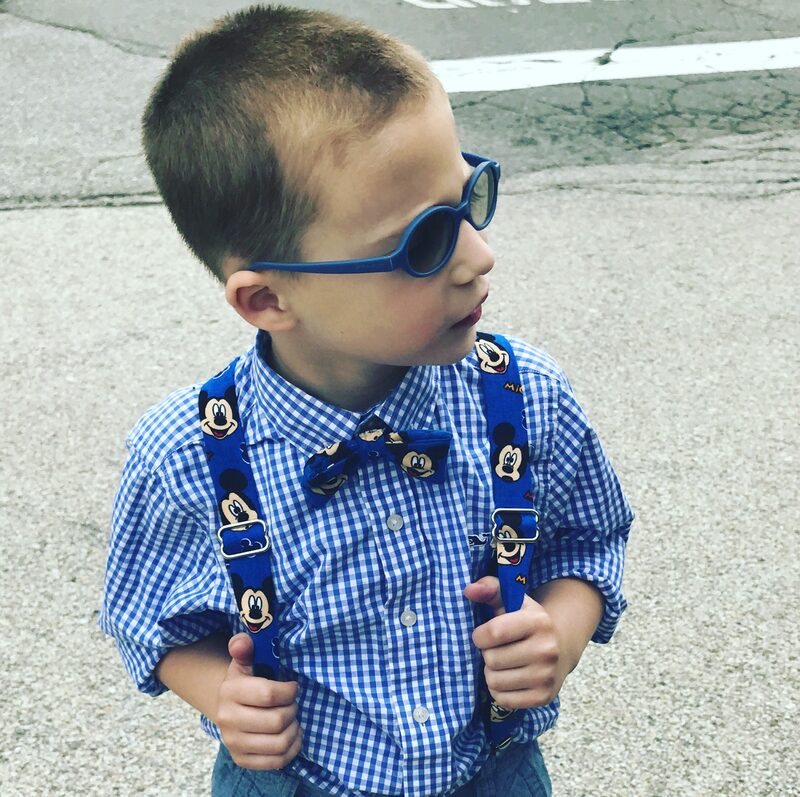 I struggled with finding any connection with Sawyer other than pushing him on a swing, giving him goldfish, watching Mickey Mouse Clubhouse, or going for a drive in a car. It wasn’t a very fulfilling existence. I had zero clue on how to connect with him. 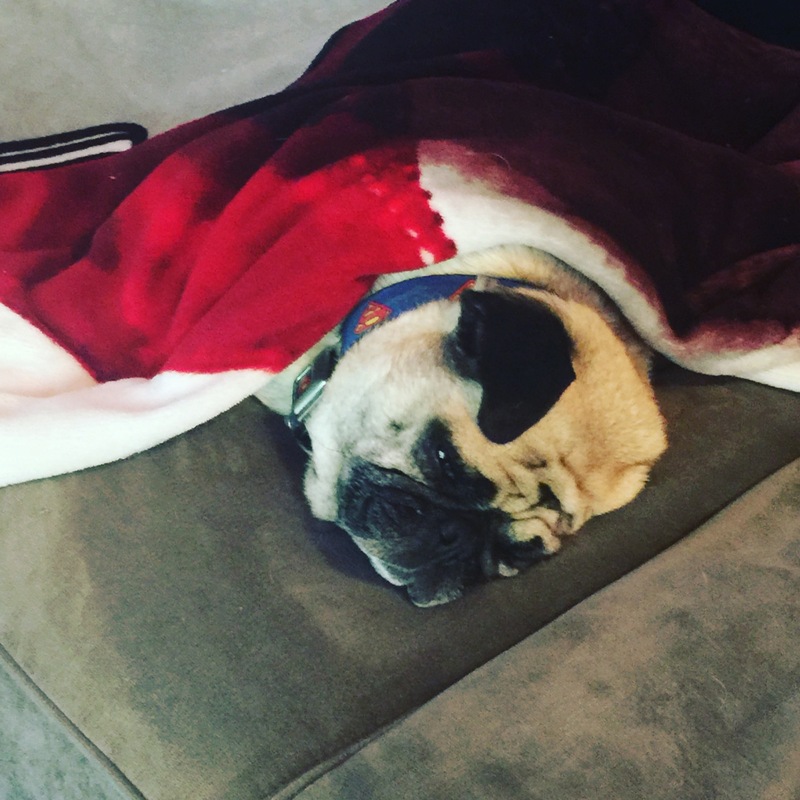 However, we had the pug. He was like a bridge for father and son. With our house on the market and my older two on constant play dates, Sawyer and I were on our own a lot. We had to make ourselves scarce as house showings were in full throttle and with my wife working, we went on many adventures during my summer off prior to the school year starting. It didn’t matter the time of day because the moment of got Oscar’s leash, Sawyer would ask if we could take him for a walk, It was another routine for autism but one that brought me comfort too. He could take me around a neighborhood based on house colors. It opened my eyes to how bright he truly was and how he must be seeing things in a way that I could never understand. How much was he taking in during our car rides? Does have an internal grid based just on color? This was fascinating. Oscar didn’t seem to mind. As long as it wasn’t too hot and we didn’t go to far, the pug was loving these expeditions. Sawyer’s sense of direction was more than understanding where he was, it gave me hope that he could learn. However, we were learning together. Oscar, welcome to the neighborhood! My late cousin always told me that having a dog to call your own was a right of passage. He thought every person who didn’t have one was missing out on the bonding experience of a lifetime. Just the thought of having a dog for our family was such a pipe dream that I couldn’t compare the feeling to anything. However, the words of my cousin were usually those of the gospel. He was in fact one of my favorite human beings that ever existed until his unexpected passing. In some ways, I found myself honoring my cousin’s ideas. Granted he was more of a rated R type of individual so I was excited to have an actual G rated idea that could work for my family. Having a family pet was as pure of an idea that Jason ever articulated. I couldn’t believe that it was becoming true in the Rubin home. There wasn’t very much planning when it came to Oscar’s arrival. We had less than 10 days before he would join us. That was 10 days of prepping Sawyer that a living animal would be with us and what that would mean. This was quite the crazy time for us. We decided to put our house on the market so that was another layer of transition. As a family, we wanted a home with more charm and space to fit our family and that decision was made prior to Oscar even being on the radar. Sometimes you just have to roll with the punches. Easy to say but autism and rolling with punches don’t go hand in hand. Sawyer had a ton of questions about all of the above but Oscar was the most pressing topic rather than moving. This was Sawyer’s script the 10 days prior to his arrival. I would love to say two years later that these questions are a thing of a past but it comes up all the time. I think that Sawyer gets comfort from the perseverating. Maybe this was and is autism? Maybe it is being anxious? Maybe it is both? I do know that is very much a constant that requires a ton of patience. We did make it past those 10 days of waiting. We had a giddy household waiting by the window for Oscar to arrive. Sawyer and I were glued to every car just waiting for one to turn in our driveway. It was like a movie to see that pug’s head sticking out the window that July afternoon. Sawyer jumped for joy when I said he was here. Finally, Oscar made it to the neighborhood and I know Cousin Jason would have been proud. As a family, we were staying above water. Sawyer was in a classroom in which was giving him the opportunities to succeed both socially and academically. If the months prior were a flood of despair, we somehow were able to climb a mountain of hope. Was it possible that we were turning some sort of corner? Could a wave of success be our future? When you go through rough waters like we were experiencing, it was nearly impossible to enjoy the positive. It was like a minute by minute routine because raising Sawyer was just that unpredictable. One moment he would be eating his chocolate raisins while enjoying Mickey Mouse Clubhouse. The next minute he could be screaming because one raisin fell out of his hand. Those episodes happened often, which made us not want to leave his side. However, we were watching these moments dissipate. It was encouraging that he was changing as he was learning. Out of nowhere, the improbable happened. We discussed how a dog could be a comfort to Sawyer. A dog? A real animal living in the house? How could this dream become true? Having a dog was a life long wish of mine. I had fond memories of my friends pets. My distorted view made me think of all of the positives this could bring to our lives. I couldn’t even think of the layers of the work it would take. I saw zero downside in this. Not to mention that this was something I wanted but to read about the calming nature that a dog could bring to a child with autism was an easy sell for me. I wanted to sign on the dotted line. Kellie and I had some conversations about this. She had a strong memory of when we first got married and fostered a puppy. It was a disaster. I was way over my head and it didn’t work out. It was noted that Jon Rubin shouldn’t get a puppy that had not been house broken. As matter of fact, if there was a manual on caring for a puppy, I’d be on the cover chronicling to do everything different from my attempts. Here was the thing. Lesson learned. If a dog could be an asset to Sawyer then I wanted an opportunity to make it work for him. I knew I could do it. I knew I could make it a success. I did know that it was a longshot. I was losing hope. Our conversations about a dog dwindled. It was a battle that I didn’t fight often due to the thought that it had to be a consensus amongst the family. It seemed like the bottom of the ninth inning with two outs and nobody on base. 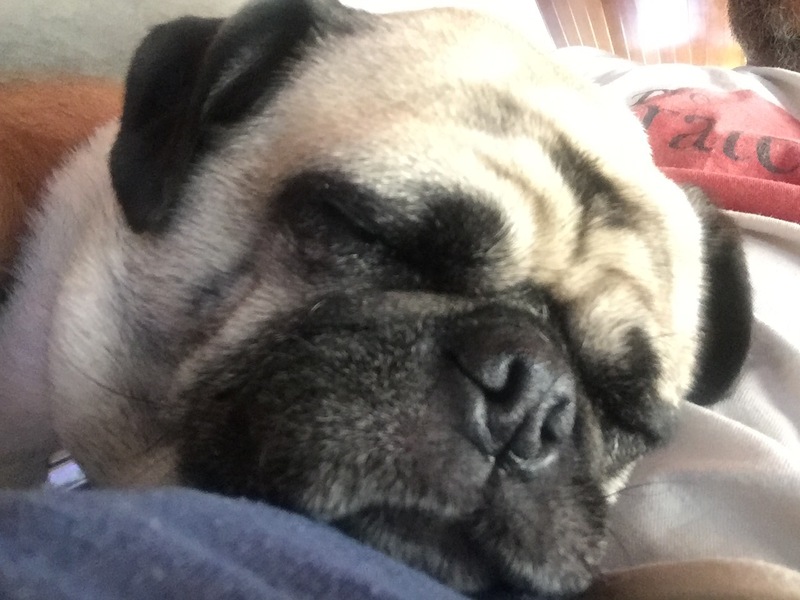 We got a call from a friend that their was a 7-year-old pug that needed a home due to the family relocating. A Pug named Oscar was at a close by softball field if we were interested in meeting him. I really thought nothing of it. However, Kellie thought it would be a good idea to take the kids to meet him. Could this be my one chance to get a dog? Was it possible that the stars have aligned? Did the universe want us to get a dog?